As Americans were learning about the latest terrorist attacks in Western Europe, U.S. Sen. Ted Cruz called for law enforcement targeting of Muslim neighborhoods, while also taking swipes at both President Obama and Donald Trump. WASHINGTON, D.C. — As Americans learned about the latest terrorist attacks in Western Europe, U.S. Sen. Ted Cruz called for law enforcement targeting of Muslim neighborhoods, while also taking swipes at both President Obama and his leading Republican presidential rival, Donald Trump. "Our European allies are now seeing what comes of a toxic mix of migrants who have been infiltrated by terrorists and isolated, radical Muslim neighborhoods," Cruz said in a statement. “We will do what we can to help them fight this scourge, and redouble our efforts to make sure it does not happen here." He further called for a "need to empower law enforcement to patrol and secure Muslim neighborhoods before they become radicalized." The comments elicited a visceral reaction from the leader of the Council of American-Islamic Relations. "Mr. Cruz’s call for law enforcement to ‘patrol and secure’ neighborhoods in which American Muslim families live is not only unconstitutional, it is unbefitting anyone seeking our nation’s highest office and indicates that he lacks the temperament necessary for any president," said CAIR executive director Nihad Awad. “We urge Ted Cruz to retract his call for fascist-like treatment of American Muslims and to offer an apology to all Americans." Democrats also spent the day blasting Cruz's statement. Most notable, though, were comments from U.S. Rep. Tammy Duckworth, an Illinois Democrat who, as a U.S. Army helicopter pilot, lost her legs in 2004 when her aircraft was shot down in Iraq. "When we say this kind of thing, we promote the divisive rhetoric, the propaganda that ISIS is selling, which will create the next insurgent that's going to shoot down an American helicopter like the guy that shot me down," she told Mashable on Tuesday afternoon. On Tuesday afternoon, Cruz and his campaign clarified that he did not want to necessarily patrol all Muslim neighborhoods but focus law enforcement efforts on areas where there is a danger of radical Islamic terrorism. "It is standard, good policing to direct your resources to where the threat is coming from," Cruz told reporters in New York. "We should do the exact same thing with radical Islamic terrorism." As an example, Cruz cited the New York Police Department's controversial surveillance program in Muslim neighborhoods under former Mayor Michael Bloomberg. 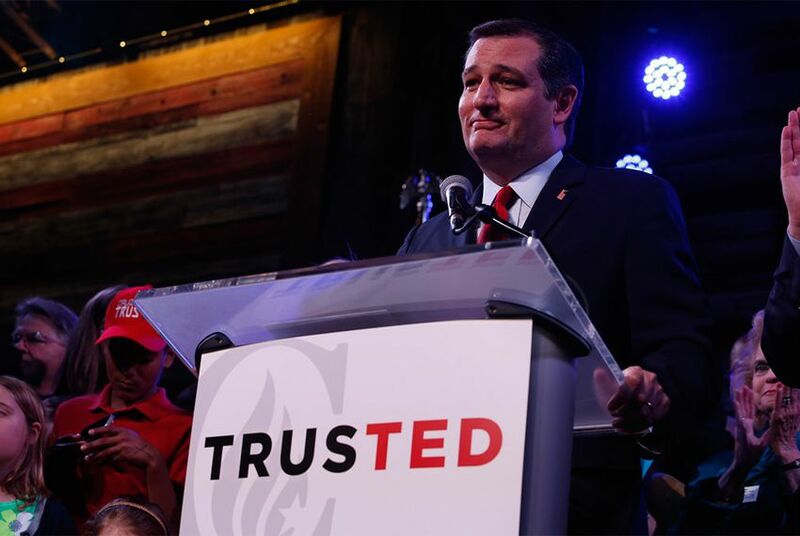 Cruz blamed political correctness for leading to the demise of the program. Speaking to reporters Tuesday morning, Cruz accused Obama of "abdication of leadership from the world" and revisited his frequent criticism of the president for prioritizing "political correctness" over what the senator perceives to be the most effective strategy for combatting the international threat from extremist Muslims. And he sought to tie Trump to that argument. "I would note that retreat from the world, the Obama-Clinton retreat from the world, is very much the retreat from the world that Donald Trump is advocating," Cruz said. "Even Barack Obama hasn't gotten so far as argue from withdrawing from NATO, the way Donald Trump has. "And the way to respond to terrorist attacks is not weakness, is not unilateral and pre-emptive surrender, abandoning Europe," he added. "Withdrawing from NATO, as Trump suggests, is pre-emptive surrender." The North Atlantic Treaty Organization is a military alliance between European nations and the United States to counter the rise of Soviet influence in Eastern Europe after World War II. Cruz's remarks were in reference to comments Trump made on CNN and elsewhere Monday. Trump aired a common American criticism of NATO — that the United States shoulders an outsized financial share of protecting Europe from outside threats. He argued the United States ought to spend less but to not decrease involvement. "I think we have to reconsider — keep NATO, but maybe we have to pay a lot less toward the NATO itself," Trump said. "So there has to be at least a change in philosophy." "Not decrease its role, but certainly decrease the kind of spending. We are spending a tremendous amount in NATO, and other people proportionately less — no good." He did not clarify how he would manage these two seemingly mutually exclusive goals. At least 31 people died in the Brussels region attack, according to The Washington Post. Jamie Lovegrove and Patrick Svitek contributed to this report.